Do you know the value of a clear and detailed inventory? In a deposit dispute, the inventory can be the deciding factor. What's more, it can often prevent a dispute from happening in the first place. Despite this, we know from our conversations with landlords and letting agents that many of you lack confidence when it comes to inventories and struggle to make yours suitably thorough. 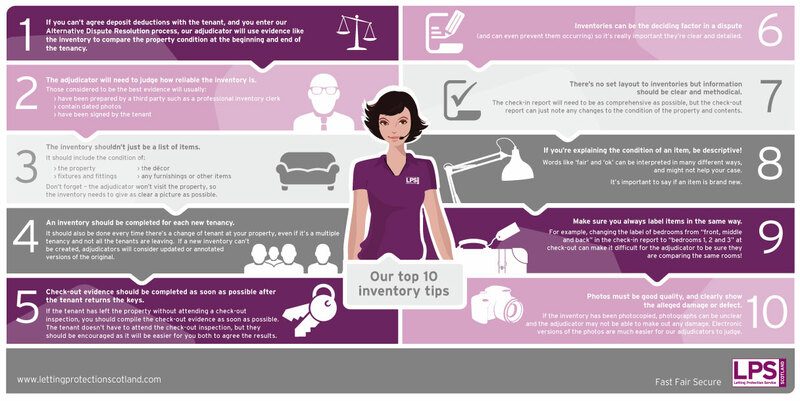 So to help you, our expert adjudicators have pulled together their top 10 inventory tips. Take a look at them and see if your inventories match our adjudicators' advice. It could make a real difference. Recently we sponsored the Agency Business conference, hosted by the Scottish Association of Landlords (SAL) Council of Letting Agents at Hampden Park on 21 May. A unique event, this is the only time that letting agents in Scotland come together in a conference setting, and was therefore a great opportunity for us to catch up with our clients. We also met a number of agents who we don’t currently work with, so we took the opportunity to share our experience with them and explore how we could help deliver their tenancy deposit protection needs. Our Head of Tenancy Deposit Protection, Daren, also contributed to the highlights video of the day, explaining why the Agency Business conference is so valuable to us. Watch it here. So you’ve protected your tenant’s deposit – what next? We’re pleased to have seen so many landlords and letting agents protecting their tenant’s deposits in line with the legislation. If you've recently protected your tenant’s deposit, here are some of the key things to consider next: 1) The Tenancy Deposit Schemes (Scotland) Regulations require certain information to be provided to the tenant within 30 working days of the start of the tenancy. To make this simple, we have developed an Information Template which you can download, fill in and pass to the tenant. Once filled in, this template contains all of the information you need to give the tenant to comply with this part of the legislation. 2) When the time comes for the tenant to leave the property either you or the tenant can initiate the deposit repayment process. If you wish to start the process simply visit our website and log into your account, selecting ‘Request a Repayment’. The onscreen guidance will take you through the process and the tenant will be notified by us that they need to respond to the claim. 3) Repayment IDs are given to you and the tenant when a deposit submission payment has cleared and both repayment IDs must be provided when a deposit repayment request is submitted. Remember to keep your repayment ID safe – it’s unique to you like a PIN number and shouldn’t be shared with your tenant as they will have their own. The repayment ID grants authorisation from both parties to repay the deposit, so make sure you keep it confidential. 4) If you and the tenant cannot agree on the amount of deposit to be repaid, then you will have the option to use our free Alternative Dispute Resolution (ADR) service. Using this service will provide both you and the tenant the opportunity to submit evidence to back up your claim to our independent adjudicators. They will then make a decision based on this evidence how much deposit should be repaid to each party. You can read more about this service here.